How many players can play Marvel Heroes locally (couch co-op)? How many players can play Marvel Heroes via system link or LAN? How many players can play Marvel Heroes online? How do you begin a co-op session in Marvel Heroes? How does save game progress work for co-op play in Marvel Heroes? Can I join a game if the host is further along than me in Marvel Heroes? Can players share or trade items in Marvel Heroes? Is there a matchmaking system built into Marvel Heroes? What are the currencies available in Marvel Heroes? Are there clans or persistent groups in Marvel Heroes? Since this is an MMO which runs off servers there is no local co-op support. 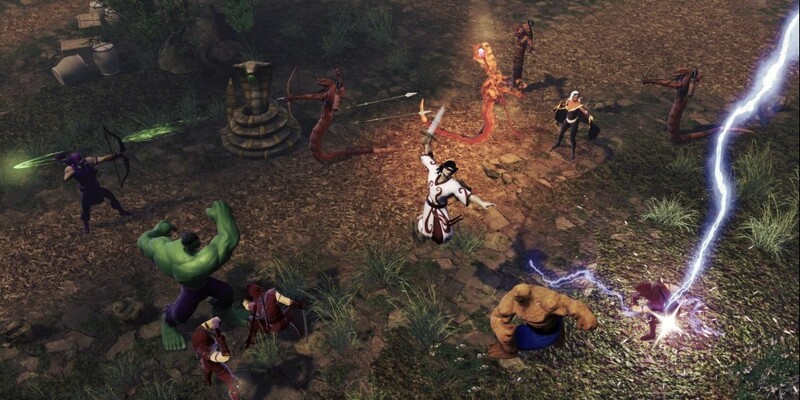 Marvel Heroes is an MMO, so dozens of characters can appear on screen at once. Instanced groups are limited to five players. There is a social tab to add friends to your Friend List. From there a party can be formed. Progress is save to each individual character. Loot and XP are specific to each player. Yes, but you will be restricted to level appropriate zones. You can\'t access later areas until you've unlocked them. Yes, players can drop items for quick and easy trades. There is auto-grouping for some endgame content. The game uses a microtransaction system, where credits called "Gs" can be bought using real money. Only for saving time. Most of the items can be theoretically dropped in game (including characters), but the drop rate is low. Paying money speeds up the process. Players can buy new characters and outfits. Yes, there are Supergroups, the game's version of guilds. Page created in 0.9120 seconds.